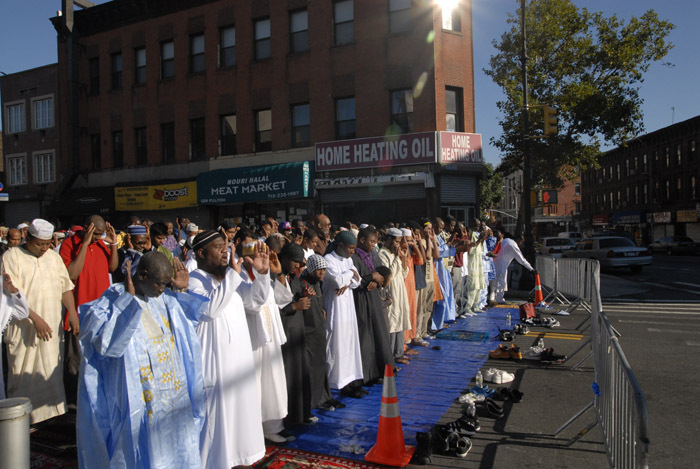 Members of Brooklyn’s At Taqwa Mosque pray in the street in front of the mosque during the celebration of Eid. Photo by Stephanie Keith ( www.stephaniekeith.com). At Taqwa’s influence radiates outward from the intersection of Fulton St. and Bedford Ave. 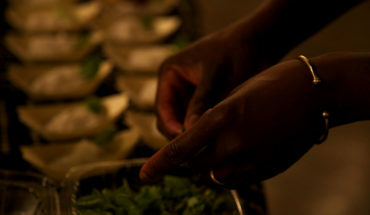 The area is home to a dozen restaurants operating according to Islamic dietary rules, serving a range of cuisines from Moroccan to Guinean to Chinese to American soul food. No pork, of course. Mixed in are shops that sell long-distance calling cards, African goods, and inexpensive suitcases. Next to At Taqwa is Zam Zam, a store selling an aromatic mix of oils, incense and religious items. Ousman Adam greets shoppers from behind the counter as they come through the door. Men and women of all backgrounds, wearing an international mix of clothing styles wave at Adam as they pass by. It’s a community with strong ties, and one with connections to almost every corner of the world. The two Fulton Street mosques offer contrasting faces of Islam in New York, hinting at the many ways Muslim immigrants approach their faith in a country that can, at times, seem hostile to the practice. At Taqwa has been here since 1981 and Adam has been the assistant Imam since 1994, with duties as diverse as leading prayers, conducting funeral services and weddings, and arbitrating disputes between community members. Born in Sudan, Adam, is the mosque’s number two behind At Taqwa’s long-time Imam and Brooklyn native Siraj Wahhaj. Born Jeffrey Kearse, Wahhaj is a controversial figure who found Islam through the teaching of Elijah Muhammed and the Nation of Islam before switching to mainline Sunniism in the mid-seventies. While many of the estimated 350 mosques in NYC have members from different backgrounds, it’s impossible to overlook the incredible diversity of At Taqwa’s congregation which, according to Adam, includes worshippers whose native tongues include Spanish, Chinese and of course, English, At Taqwa’s language of religious instruction. Down the street at the much smaller Sufi mosque, Baro, the congregation’s marabout, is starting his day with a take-out container of rice and chicken, which he offers to share. An immigrant from Senegal, Baro is a Koranic teacher in the West African Sufi tradition. While many of the neighborhood’s Senegalese, Mauritanian, Guinean and Malian worshippers head to At Taqwa, others prefer to worship in the mystical syncretic tradition of marabouts like Baro who leads prayers in Arabic and, like many of his congregants, is more comfortable speaking French than English. Small groups like Baro’s, defined by the particular Sufi brotherhood they belong to, meet in makeshift spaces and private homes all over the city. Stressing inwardness, reflection, and a close personal connection to god, Sufism can be practiced as part of both Sunni and Shia traditions although it is often derided by more orthodox adherents. Many of the Islamic worlds’ most famous poets, musicians and authors come out of Sufi traditions including Rumi’s love poems. Not all Sufis are as withdrawn as the Fulton Street group. Imam Feisal Abdul Rauf ran a lower Manhattan mosque for 27 years and became nationally known in 2010 after the Islamic community center he planned to build was branded by right-wing critics as the “9/11 mosque.” Despite the ugly episode of public xenophobia and Islamophobia that followed, Rauf continues to present a public face. Today he runs the Cordoba Initiative, an organization trying to foster a Muslim-American identity. At Adam’s shop, individually packaged miswak are available alongside knick-knacks and products from the Muslim world. He says that At Taqwa actually attracts quite a few young American-born Muslims, many of whom also participate in more traditional religious practice within their communities but prefer At Taqwa’s English-language sermons. Developing a Muslim-American identity is not high on Adam’s list of concerns. 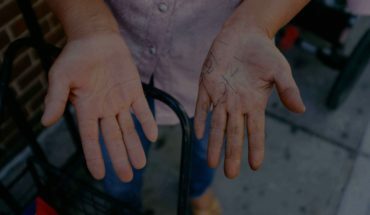 “What we believe,” he says, “is that the real Islam we practice is about balance.” This balance, he says, means staying away from extremes, making prayers, and otherwise living like ordinary New Yorkers. Outside the mosque, he says, the congregants are doctors and engineers, shopkeepers and students—people who “enjoy their vacations” like anyone else. 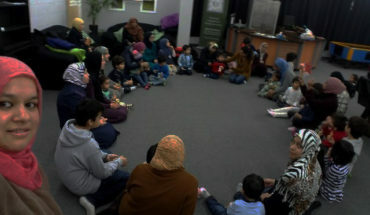 The mosque also attempts to foster relationships with its non-Muslim neighbors by holding regular open houses. Increasing gentrification has meant a lot of new faces in the neighborhood, some who have complained to the city about the muezzin’s call. “This mosque” says Adam, “has been here for 34 years. People around here grew up listening to the call to prayer.” Nevertheless, At Taqwa makes sure to turn down the volume of their early morning and late evening broadcasts to comply with New York City’s noise code. But as far as their right to do it, Adam says, it’s a part of his practice as a Muslim and within his First Amendment rights as an American. “No different from church bells,” he says. Aaron Leaf is a writer, editor, and digital producer based in New York with a special interest in African politics, immigrant diasporas, and the future of cities. Raised in Canada, he has lived on four continents and has written for a wide variety of publications. Recent bylines include Al Jazeera America, The Nation, The Globe and Mail and The Guardian.